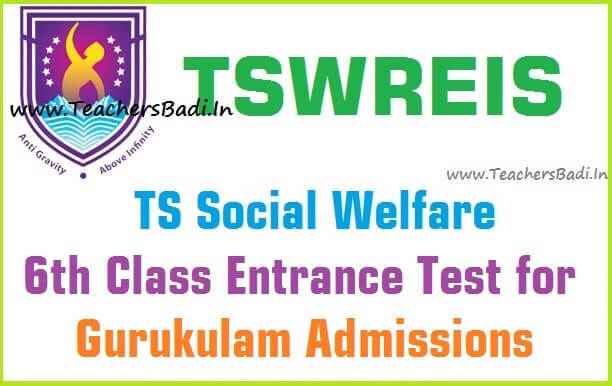 TS Social welfare 6th Class entrance test 2016/tswreis gurukulams class 6th admissions, online application form, last date for apply,hall tickets,results,certificates verification dates, Social Welfare Residential Schools Common Entrance Test-2016 for Admission into #6thClass, Telangana SWAEROCET 2016, Sixth class admission test details given here. The TSWREI Society visualizes to provide quality modern education to the talented students belonging to marginalized section of Society predominantly from rural areas through the use of modern TECHNIQUES, Pedagogy and various experimental learning activities in a stress free environment to make learning a joyful experience. As per GO.no.20, dated: 02/06/2016, the TS Social Welfare department has published the 6th class admission test 2016 on 07-06-2016 and online application forms are invited from the eligible candidates for admission into Class VI for the academic year 2016-17 in newly sanctioned 103 Social Welfare gurukulams and applications have to be submitted ONLINE. Before filling the application through online with the required details and supporting certificates it is essential that candidates read the information already uploaded in the website tswreis.telangana.gov.in. 1. The students belonging to SC & ST should have born in between 01.09.2002 to 31.08.2006. 2. The students belonging to OC / BC / SC-Converted Christians (BC-C) who born between 01.09.2004 to 31.08.2006 are eligible. 1. The candidates should have studied continuously in the respective district for the two academic years (2014-15) and (2015-16) in a Government school or in a school recognized by the Government of Telangana. 2. During the academic year 2015-16 the candidate must be a bonafide student of Class V of a recognized school. 1. The parental income should be Rs.65,000/- in Rural areas and Rs.75,000/- in Urban areas. 2. The candidates can apply through online to any TSWR School of the district which he / she belongs. Online processing charges only should be paid to Meeseva Kendra any other fee must not be collected from parents. 1) The selection purely on merit basis through written test. 2) Admission will be given as per merit obtained in Telangana-SWAEROCET 2016 and the preference of institution given by the student in online application. 1. The test will be held on as per schedule from 11 :00 AM to 01: 00 PM for maximum marks of 100. 2. Admission test will be held in English, Mathematics and Environmental Science based on State Syllabus of 5th class prescribed by Telangana State Government. 3. The questions will be of objective type and will be both in English and Telugu Medium. 4. Test will be conducted in the opted centres of the district mentioned list in the notification. Candidates are advised to collect application form and Hall-tickets immediately after submission of application online. 1. Candidates can submit application through online by visiting website www.tswreis.telangana.gov.in or visiting any Meeseva Kendra. There is no registration fee for submission of application through online. 2. The candidates should choose examination centre of their own choice in the district. 3. It is compulsory that, the candidates should select the order of preference of school into which he/she wants to seek the admission in their district. Boys should select all the boys schools in the district in the order of preference. Girls should select 10 schools from the district so that allotment will be made as per merit and option. 4. Based on the merit and option of the applicant, school will be allotted for admission. About TSWREIS: Telangana Social Welfare Residential Educational Institutions Society (TSWREIS) has been successfully running 134 Institutions exclusively meant to cater to the educational needs of the children belonging to the marginalized communities. Ever since its establishment, the TSWREI Society has been cruising along the path of glory, disseminating education, to the economically and socially backward communities. In nearly three decades of its existence, the society had moulded the lives of thousands of marginalized children. The Government of Telangana recognized the pivotal role of the Society in shaping the future of the marginalized people. The visionary Hon’ble Chief Minister, Government of Telangana who gives top priority to the education of the downtrodden people was greatly impressed by the path-breaking transformational work done by the Society. On the occasion of the 125th birth anniversary of Dr.Babasaheb Ambedkar, Hon’ble Chief Minister of Telangana announced One Hundred and Three (103) New Residential Schools for Boys and Girls and Thirty (30) Residential Degree Colleges for Girls exclusively for the marginalized sections to be run under the TSWREI Society from the Academic Year 2016-17.